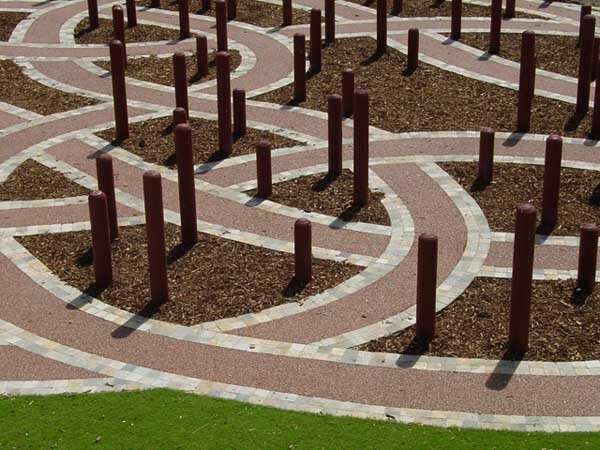 The Rockpave permeable paving range from MPS Paving Systems Australia is an environment-friendly paving solution that also delivers several practical advantages as well as colourful appeal. MPS permeable paving systems allow water to pass through, preventing the build-up of puddles or ice patches that can be hazardous to pedestrian or motor traffic. They also reduce water run-off, ultimately reducing the burden on antiquated stormwater systems while allowing water to reach trees and plants. Rockpave permeable paving systems use natural stones and the vivid colours of recycled glass to reflect the natural beauty and warmth of the Australian landscape. Available in amazing colour combinations, the Rockpave range allows landscape designers to create virtually any external design for paved surfaces including custom logos, artistic concepts, traffic management solutions and architectural hardscapes. Key advantages of Rockpave permeable paving systems include ability to withstand the hot Australian sun as well as the cold temperatures of winter unlike other resin-bound systems; UV stability; design flexibility; excellent adhesion properties; and versatile application range with installation allowed over crushed rock, asphalt or concrete surfaces. MPS Paving Systems offers numerous permeable paving solutions including FlowStone, a specifically sized aggregate that creates a permeable paving system; and SuperStone, a bold stone finish for exterior concrete ideal for pedestrian paths, driveways, carparks, courtyards and entrance ways.